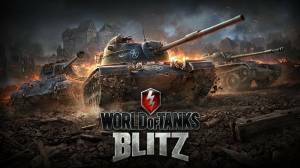 World of Tanks Blitz is a free-to-play 3D cross-platform strategy MMO set in World War II that allows you to take control of a moving tank which you can customise and have battles with up to 14 players per match. Although based on its popular PC counterpart the mobile version lacks many of the vehicles and most modes of the PC version. What are the Tank Types? What are the Different Maps? What Ammunition should I Buy? What are Consumables and Provisions? No discussions open for World of Tanks Blitz at the moment.